My post about how to customize WordPress images with tricks like greyscale and such got me lots of feedback, so I figured I might as well turn it into a plugin. The ImageFX plugin allows you to customize the image sizes from WordPress or custom ones for your theme, by applying filters to them. The way it works is basically identical to my original post on the topic, only it allows the filters to be defined on a per-image-size level. It also allows the addition of a “slug” to be appended to the image filename, which is useful for cases where you want to have two images at the same size, but with different filters. Here’s some examples. 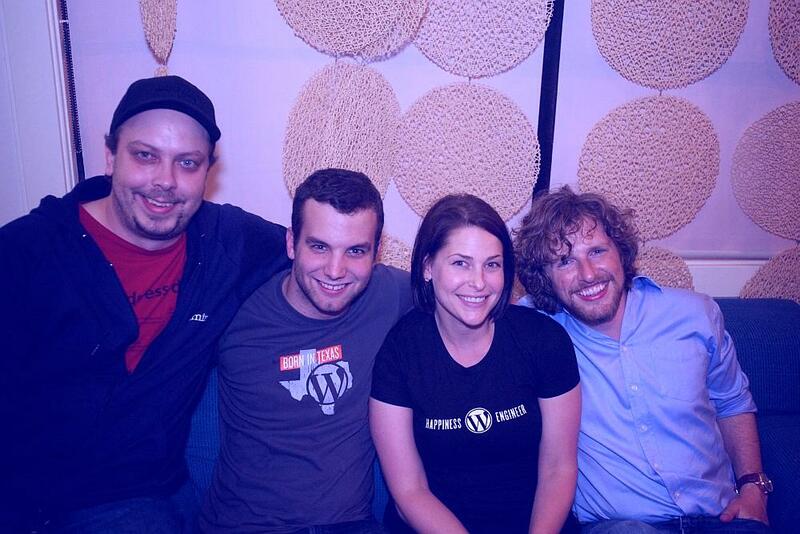 This a pic of me, Nacin, Rose, and Matt at WordCamp San Francisco. I ran it through the sepia, blue colorize, and grey-except-red filters. These are some of the default filters included, but since I could, I went ahead and made it easily expandable too. All you have to do to define a filter is to create a function to do the image filtering you want, then call the imagefx_register_filter() function to add it. Note that the $image is passed by reference, so you don’t have to return it. This is because the $image resource takes up a lot of memory, so to save on memory usage, you are manipulating it in place, sort of thing. You can use any of the image functions in PHP to change the image however you like. The filters I’ve implemented are mostly pretty simple. You can see them all in the filters.php file, in the plugin. Caveats: The plugin will only filter JPG images, to avoid the overhead of recompressing PNGs and to avoid breaking animated GIF files. Also note that I haven’t tested these filters extensively. They’re only a starting point, sort of thing. I spent all of about 20 minutes writing them, so don’t expect miracles.